Last Friday, my Baby Brother and I decided it would be a super fun idea to strap ourselves to a rope and walk around the outside of a super tall building in downtown Toronto. 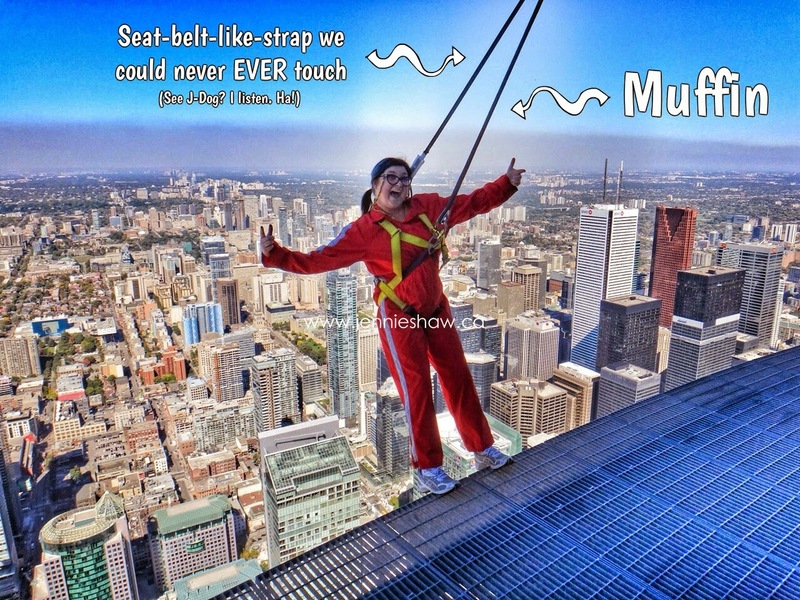 Interestingly enough, we aren't the only people who've been struck with this magnificent idea because The CN Tower offers a little activity called EdgeWalk, which is located at a fairly ridiculous height of 356 meters (1,168 feet), and therefore saved us from improvising with our own cables and pulleys on top of the BMO Building. You're welcome, Whichever Emergency Services Unit Would Have Had To Come And Save Us. Ha! I'm just kidding with the intro. We had a gift certificate from BB's birthday last year, but that's not much of an opener so I took some liberties. Writers are allowed to do that, you know. It's, like, a rule. Haha! 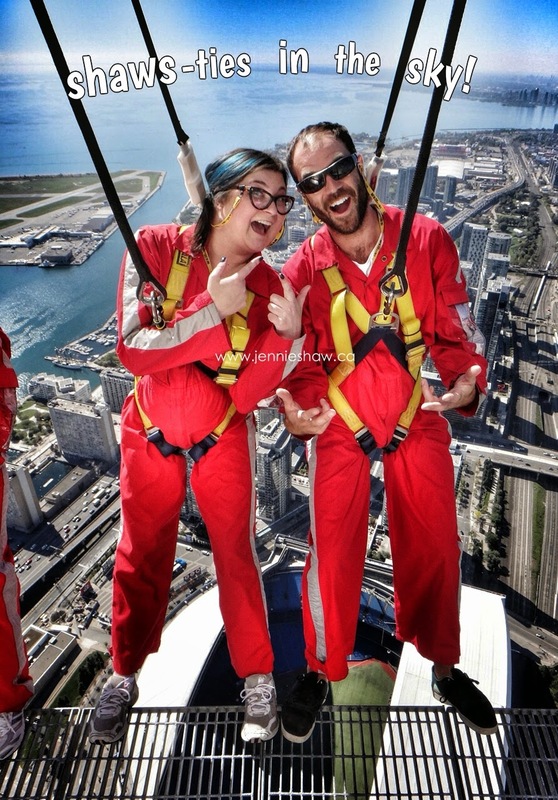 EdgeWalk is CN Tower’s most thrilling attraction in its history, and the first of its kind in North America. It is the world’s highest full circle hands-free walk on a 5 ft (1.5 m) wide ledge encircling the top of the Tower’s main pod, 356m/1168ft (116 storeys) above the ground. Visitors walk in groups of six, while attached to an overhead safety rail via a trolley and harness system. 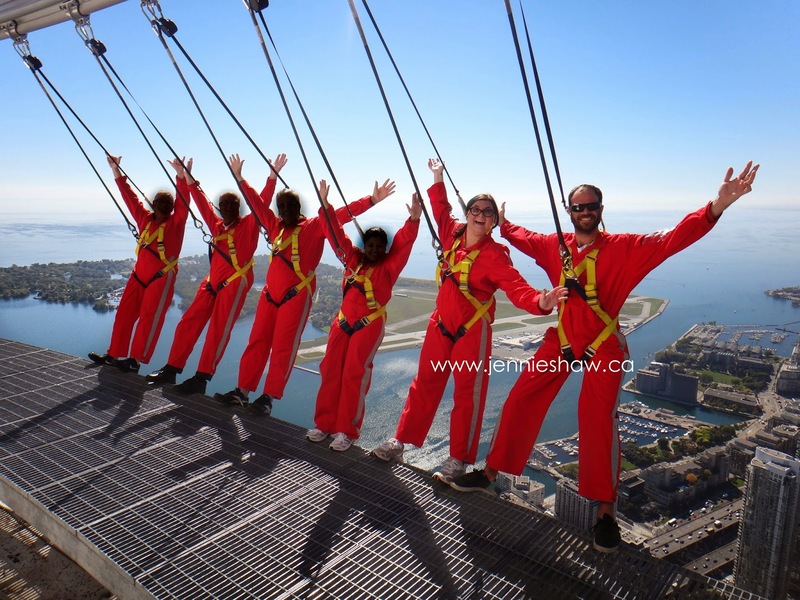 Trained EdgeWalk guides will encourage participants to push their personal limits, allowing them to lean back over Toronto with nothing but air and breathtaking views of Lake Ontario beneath them. It really was! On both accounts. Ha! Not surprisingly, it was quite the process to get up to the platform, which is the same width of an average Toronto sidewalk. Shout-out to our guide, J-Dog, for all the random facts! Note: His name wasn't actually J-Dog but I like to keep it real-name-light on my blog. You know, because of stalkers. Ha! Plus, because we've shared a seriously cool and unique experience, his actual name feels too formal for the bond we now share. Not that he'd ever remember me or BB because he saw about a bazillion people this summer but the nickname will still stand. The prepping included a breathalyzer, drug residue swab, removal of all jewelry (this took me ages as I don't do accessory-light), metal detector wand-age, getting fitted for super fashionable* orangey-red jumpsuits (*read: terribly unflattering), full-body harnesses, long hair restraint (via a standard issue elastic because I didn't have one of my own), a shoe-check, and, of course, lots of safety instructions that included no spitting (gross). After that, we were ready to go! There's a small chance I was more excited than BB. Ha! We shot up the mega-fast elevator, making sure to take a gander through the glass sections, and then walked into a room that's probably quite similar to one an astronaut would find themselves, pre-launch, only with less oxygen paraphanialia. It was here that J-Dog gave us our final safety talk. The most important tips being that we could only hold onto the black rope and to never ever touch the seat-belt-like-strap behinds our heads, or any clips. To make us more comfortable, J-Dog told us to name our black safety ropes. Because I know you're wondering, my black rope's name was Muffin. When everyone was clipped in, we walked outside and onto the platform. It was crazy face, guys. The view was unlike anything I'd seen before. It was like being in a plane, but lower and less contained because there was nothing obstructing our view. The weather was fan-freaking-tastic, with zero clouds and virtually no wind, so you could see all the way to...well...I don't know exactly where you could see to, but it was pretty much forever. Give or take a few kms. The walk was divided into four sections, conveniently lining up with the four major directions: South, East, North, and West. In each section, we did a different activity. For the South, it started with "Toes Over Toronto," where our group walked up to the edge, one at a time, and stuck their toes over the edge of the ledge. After that, we faced the Tower, sat down, and walked ourselves until our toes were the ONLY thing touching the ledge. It was...intense. To say the least. Then, on the East side, we did the CRAZIEST thing and leaned forward. Like, over the edge. If the sitting down was intense, this could be described as Intense Fest 2.0: I May Have Made A Poor Life Decision Coming Up Here Because My Life's About To End. But as terrifying as it was, it was even more exhilarating. Truly something that I'll never forget. Mind you, the whole thing feels like a dream because it was seriously hard for my brain to process that we were so freaking high up at the time, but I vividly remember the feeling. And it was AWESOME. Different photo ops, practicing our new EdgeWalk leaning back skills, made up the North and West sections. Apparently, the open-mouthed, faux yelling smile is genetic. After our twenty-minute escapade was over, we got back inside the space room, de-clipped, and headed down to chat about how incredible it was while waiting in the lobby for our pictures and video. Video, you ask? Yes folks, it's true. The entire time we were up there, J-Dog was filming us, and we each got a DVD copy as well as two photos. Now, J-Dog took way more pictures while we were up there, so we sprung for the extra ones because why wouldn't we want all the memories? 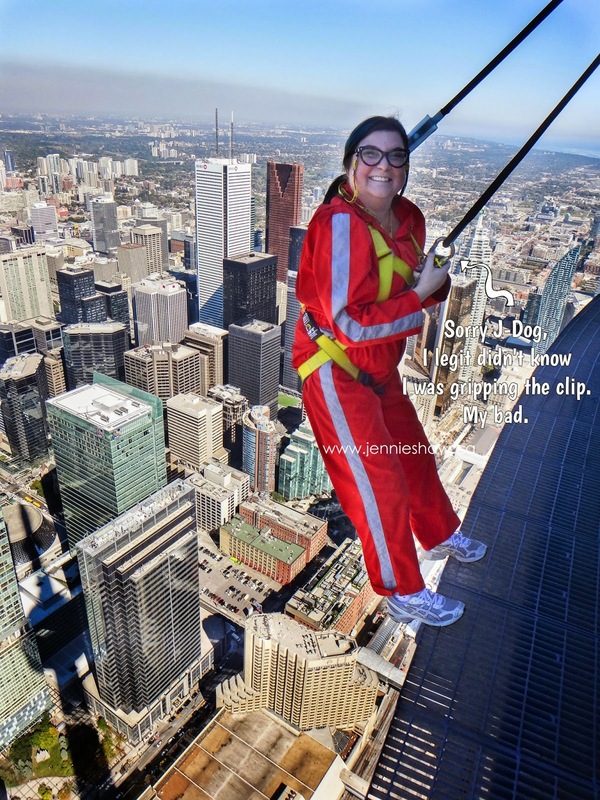 So if you're in Toronto and you're in the mood for some adventure, get yourself over to the CN Tower and live life on the edge. Literally. Haha! Ask for J-Dog (although nobody will know who you're talking about, ha)! 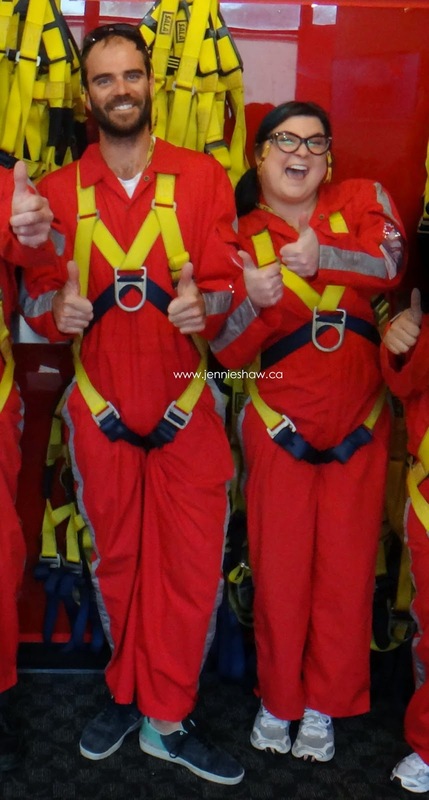 Also, if anyone from the CN Tower/EdgeWalk management is reading this, as the internet has a way of doing that, I'd like to point out that J-Dog was an incredible guide: funny, knowledgeable, friendly, and he remembered all of our names, which is mind-blowing. You should probably give him a raise...once you check his picture with your staff list to confirm his real identity. And because my BB is mega talented in the film department, he edited our video so it's only of us (and J-Dog, because the camera's on his head). There's a bit of swearing (can you blame us?!?!) so you may not want to crank the volume if you're in a public/work space. But aside from that, it's a pretty funny 6:38. Mostly because I lose my mind for the first half. Haha! 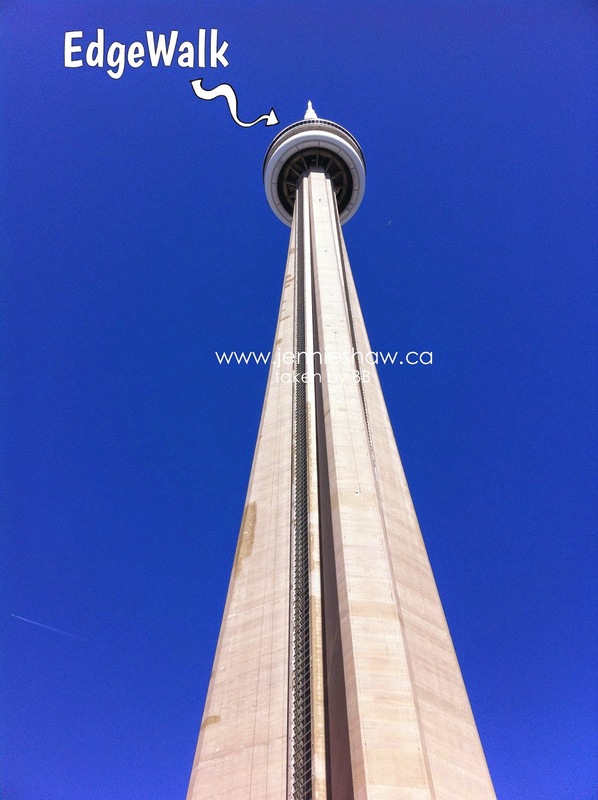 Note: I was no way compensated by the CN Tower/EdgeWalk to write this post. Nor was I bribed by J-Dog. This is my honest opinion about a fantastic experience, so please take it as only that. you are so brave to do this. I wouldn't be catch doing this. I'm so afraid of heights. This looks like so much fun! I've been up in the CN Tower, but haven't done this before. I may have to try it next year. Hoooooly crap!! What an adventure!! I'm so impressed by how boss everyone looks - no one looks scared. My stomach was turning with anxiety just looking at the pictures! !